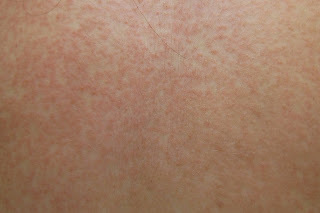 Morbilliform rash is a skin condition which closely resembles measles apparently. The rash appears as rounded about 2 to 10 mm in diameter macular lesions. The rash is confluent in places. Morbilliform rash is a symptom of many diseases like Kawasaki disease, meningococcal petechiae, water house Friderichsen syndrome, dengue, rubella, and syphilis and echo virus. Morbilliform rash is a type of maculopapular rash. The eruptions appear as embossed on the skin surface. The appearance may look like pimples and on touch, the rash may be warm. The patient keep on itching making it worse. This rash disappears after the effect of drug diminishes.The rash itching can be subside by the use of corticosteroids. The bacterial allergic reaction triggers the immune system in body and leads to the rash occurring on surface. This condition cause inflammation and this can be subside by the use of antihistamines and corticosteroids. Available in topical and oral dosage form. Neck, chest and arm region are the most susceptible sites in case of bacterial allergic reaction. Along with the medications, the patient also have to avoid the drugs causing Morbilliform rash along with some life style modifications. Patient have to avoid some selective fabrics increasing itching and rash. There are three main general reasons behind the occurrence of Morbilliform rash i.e. viral allergic reaction, bacterial allergic reaction and drug interaction. Due to drug interactions, mostly antibiotics, occurs because the body cannot tolerate the foreign changes occurring to the body. The occurrence of Morbilliform rash due to viral attack mostly in children. The viruses involved are rosella and rubella virus and can be easily identified. It may be difficult to identify virus in adults. The bacterial attack causes the immune system of body to respond as immune system tries to defend body and as a result rash occurs. Morbilliform rash is considered the type of maculopapular rash. The eruptions appear as embossed on the skin surface. The appearance may look like pimples and on touch, the rash may be warm. The patient keep on itching making it worse. This rash disappears after the effect of drug diminishes. 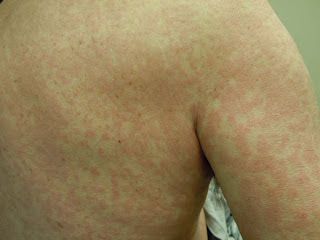 The rash appears red in color and the size of the eruptions appearing is from 2 to 10 mm. the arms and chest region is the most common site for the occurrence of Morbilliform rash in case of bacterial allergic reaction. Morbilliform rash is the rash resembling measles but the treatment is different according to the underlying cause of Morbilliform rash. The treatment is selected according the cause and combined with the drugs relieving symptoms of rash. The class of steroids mostly corticosteroid is prescribed according to the patient preferred route of administration i.e. oral or topical. These are responsible for reducing the rash, inflammation and itching. Antihistamines are used in treatment if the cause behind it is a bacterial attack. As bacterial attack activates the immune system of body so antihistamines are more effective in this case.